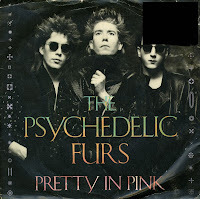 'Pretty in pink' was originally recorded as a track on Psychedelic Furs' 1981 album 'Talk Talk Talk'. When John Hughes made his movie 'Pretty in pink' in 1986, it was named after the Psychedelic Furs track. The song was re-recorded by the band for the movie and released as a single. In this version, it became their biggest hit in the UK, peaking at number 18. The Psychedelic Furs formed in England in 1977. The band initially consisted of Richard Butler, Tim Butler, Duncan Kilburn, Paul Wilson and Roger Morris. Morris and Kilburn left the band five years later, when the other members went to live in New York City. 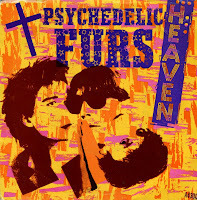 The album 'Forever now' (1984) spawned the UK hit single 'Heaven', which peaked at number 29 in the UK singles chart. The song 'Heaven' didn't appeal much to me at all when I got to know it via this video in 1984. I thought the singer was behaving bizarrely by circling round in the rain like that. The fact that I finally bought the single was a strange case of belated insight: I got a bit melancholic about the past and suddenly realised that this song was worth owning after all. As it turned out, I got hold of a Portuguese pressing.